Perry Coniglio, 43, of Highland Falls, was arrested during a police raid captured on video for holding an 81-year-old Marine Corps veteran hostage in a motel for at least four years in order to steal his benefits checks. 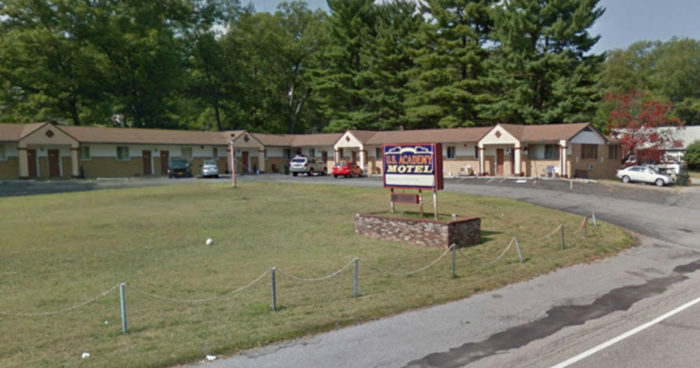 According to CBS Local Perry Coniglio was arrested July 19 in his room adjoining the victim’s at the U.S. Academy Motel in Highlands, just feet away from a building housing police and ambulance services in the Hudson Valley town. The charges against Coniglio include grand larceny and unlawful imprisonment. Police say he used brute force and intimidation to get veteran David McClellan to cooperate with him. Investigators say the victim received three checks every month. The amounts weren’t released. Conligio faces multiple charges, including criminal possession of a weapon, endangering the welfare of an incompetent person, grand larceny, menacing, unlawful imprisonment and unlawful possession of marijuana. Coniglio is being held in jail Thursday on $15,000 bail. It’s unclear if Coniglio has an attorney.